Walkers are not renowned for their packaging design skills. Actually, that's not entirely true - they pay a fortune to have designers draw up packaging designs based on a brief that almost always fails to address what should be done. However, Sun Bites are a little different. There is of course flavour colour coding for the bags. There are neat graphics of wheat and butterflies. The Walkers logo does not dominate. It all looks a bit shabby chic and metropolitan, as well as providing the sort of imagery health food fans seem to like. Of course there is nothing healthy about the snack, but we won't let that spoil the story Walkers are attempting to tell. These snacks crunched very similarly to Crisps. There was an initial reluctance to break down, but after the first couple of bites, they crashed nicely to a rapidly approaching much stage. These wheat, corn and chemicals snacks have oodles of character. They are rectangular in shape. They have lots of oil blisters. They are corrugated rather than Rippled. There are brown corn spots. The main colour is a crusty sort of orangish brown. There was a feint whiff of Sweet Chilli when we opened the bag. 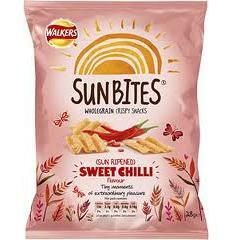 You have to love the claim that the flavour is 'Sun Ripened' Sweet Chilli. Sun Ripened is of course just a phrase - the flavour is made from chemicals in a laboratory. You also have to love the claim that these snacks contain 30% less fat that Potato Crisps. There are some really fat ladened Crisps out there, so almost any snack could say that - it may as well have said 30% less fat than a doorknob. Anyway, getting on to the flavour - yes, Sweet Chilli. That is more Sweet than Chilli, but is still quite nice.